Renata Králová’s profession is a theatre producer and an entrepreneurial woman by nature. Immediately after the tragic tsunami she ventured with her friends to Sri Lanka to perform for children struck by this disaster. This year’s trip to Sri Lanka will already be her third and during her travels she acquainted herself with virtually all types of social institutions. Renata Králová helped to organize theatre performances for children in Czech hospitals. When she heard the news about the tsunami, she immediately knew that what suits the Czech children could also help the children affected by a natural disaster. Thanks to Michal Skribucký from the Czech Red Cross, who travelled to Sri Lanka immediately after the disaster only with his backpack and three suitcases stuffed with medications, she acquired valuable tips on the most damaged locations on the island and in March last year she and her colleagues travelled there. “We travelled in areas that were maximum five kilometres from the sea. There were refugee camps everywhere, filled with hundreds of children without any direction to their spare time activities. All welfare organization concentrated on ensuring accommodation and food. It was a difficult choice to decide where we will perform in those ten days,” Renata Králová says. This spring, she travelled to Sri Lanka again, this time with puppeteers Jarmila Enochová, Fáňa Váša and Helena Zavadilová. During their second visit they decided to concentrate on children’s facilities, on refugee camps, but also played in the so called somebodhi houses, which are state institutions for physically and mentally handicapped of all ages, as well as orphans. One of the somebodhi houses was flushed away by the tsunami and its inhabitants perished. “We visited a somebodhi house in Baddegama, which was ruled by the strict hand of its female administrator Nana. It was inhabited by about fifty to sixty persons of all ages, both physically and mentally handicapped, and about five members of staff. This facility included a school,” says Renata Králová. The biggest problem here was the fact that this facility was not barrier-free even though large part of its clientele had mobility problems. Group of Czech actors had problems in finding a place to play, which could accommodate everyone. We also visited a state orphanage in Ruhunu, where there are dozens of children younger than three living in terrible conditions. Meanwhile a few kilometres away there is a private orphanage Holland House of Hope built by a Dutch welfare organization. It can accommodate ninety children, four children per nurse, so it offers more of family setting. Till now they only have thirty six orphans, but when they asked to transfer children from Ruhunu, it proved to be impossible. State orphanages receive state subsidy per orphan and they do not wish to lose this. Enterprising Renata Králová used her visit to Sri Lanka to get to the Minister of Health and Social Affairs of the Southern District, in order to acquaint him with her other projects, but as soon as she mentioned Ruhunu, he turned the deaf ear. 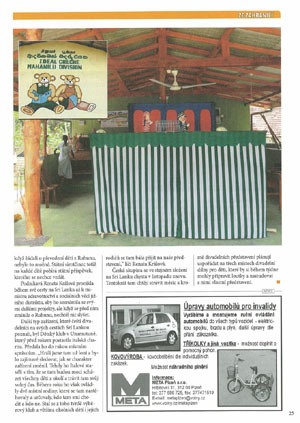 Another type of institutions that the Czech actors visited during their travels on Sri Lanka, was the Children’s club in Unamutuna, which was built a year ago by an Italian welfare organization. It was handed over to local administration. “We’d already played there a year ago and it was interesting to see how the institution changed. The Italians built it to accommodate the spare time activities of all local children. Within a year however, it was occupied by two local families, which moved in there and which decide who can come and visit the place and who cannot. It became sort of an exclusive club and most local children and their parents were afraid to come and watch us play,” Renata Králová adds. This Czech group is planning to visit Sri Lanka again in November in the same setup. This time they want to stay for a month and besides theatre plays, they intend to prepare theatrical workshops for children, who would have a whole week to prepare their own puppets and to prepare a play. Prague based puppeteers Ariana Shameti and Renata Kubišová have recently traveled to Sri Lanka. They’ve visiting refugee camps and orphanages around the city of Galle with their new clown show. These two Czech actresses played two shows a day, traveling through the undisrupted inland regions as well as through ravaged coastline. “We’ve seen broken houses, debris, even a taxi cab jammed in a third story window of a shopping centre”, describes photographer Petr Našic, who is accompanying the actresses on their trip. The idea to play for children, who lost their parents to the tsunami, was born in the mind of producer Renata Králová; she acquired sponsors and went out to map the terrain in Sri Lanka, carefully planning all the routes. She opted to cooperate with the said puppeteers due to their experience with traumatized children. With the Studio Bubec they play in orphanages and hospitals with seriously ill children (cancer and burns victims). The puppeteers have anyway prepared a clown play about a flamingo, a banana and a fish. They were remotely inspired by the fable of the fox, the crow and the cheese. “We wrote a loose text, leaving open spaces for improvisation, in order to accustom to any situation and to be able to draw the viewers into the play,” Renata Kubišová specified. We played on open air, semi-ruined houses, clubrooms and also in large tents. “The children on Sri Lanka react spontaneously and with great temperament. They smile at you, ask you where are you from and they’re really nice. You know that they’ve lost their parents a few months ago and you see more light in their eyes than sadness. I perceive the whole of Sri Lanka like this: beauty and magnificence, both in respect to sceneries and people. Prague/ A year later, socially outcast Roma locations are once again travelled by a pair of theatre actors Jarmila Enochová and Fáňa Váša. Until the end of October, they will perform a “slightly” Scary fairy-tale for children who spent their spare time on the streets. It is about a bogeyman, which fails to scare anyone, does not know how to frighten properly and wishes it was liked by all. 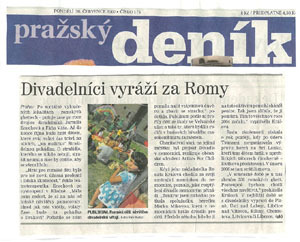 “Playing for Roma children was a new, amazing professional as well as human experience,” drama therapist Enochová noted after the performance in Kladno. “I was happy that the children still remembered us from our last visit. As soon as they’ve noticed us, they shouted: Will there be the fairy-tale about the dragon again? We slowly managed to gain mutual trust and abandon all fears,” she added. The audience consisted of pupils from the primary school in Velvarská Street and also those that live with their parents on the premises of a former meat processing plant just outside the city. This welfare event, which was sparked by Theatre in hospitals, is organized by citizen-action public Artists for Children. When its founder Renata Králová used to visit her dying mother at the hospital, she understood how important is the distraction that theatre brings to the ill. “By coincidence I met my classmate, actress Marta Miková, who performed fairy-tales for children in hospitals and she was looking for someone, who would help her with fundraising for this activity. I promised to help her and that’s how it all started in 2004,” Králová told us. She gained much experience one year later, when she organized an expedition of actors to tsunami stricken Sri Lanka, where they performed drama and puppet plays for children in refugee camps. In February 2006 they returned to Sri Lanka again. Theatre actors from the citizen-action public Artists for Children are once again this year conducting welfare projects devoted to children living in difficult conditions. Programs lasting from the beginning of June until the end of October attempt to captivate them and help them forget their traumas. “I understood the importance of impulses from the outside world and momentary distraction, when I used to visit my dying mother some time ago. By coincidence I met my classmate, author, director and actress Marta Miková, who was the first to play for children in hospitals (editor’s note: ion 2005 she founded the Civil-action public PUPPETS IN HOSPITAL), and so I said to myself that I should also help out with fundraising,” says the television and TV producer Renata Králová. Subsequently, in July 2006 she and photographer Petr Našic founded the citizen-action public Artists for Children (AFCH), which asks theatre actors to take part I projects for disadvantaged children. 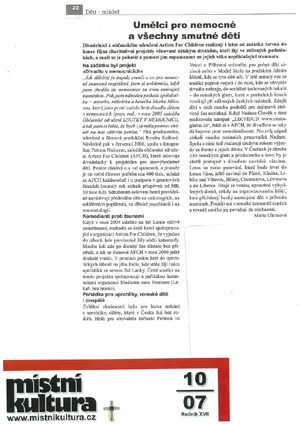 The organization raises money from sponsors and since its yearly activities cost about CZK 400 thousand, AFCH is also getting involve in grants proceedings (last year they received a grant from the Ministry of Culture worth CZK 50 thousand). Actors address by the association visit children in oncologic units, burns units and also at children psychological units and trauma units. 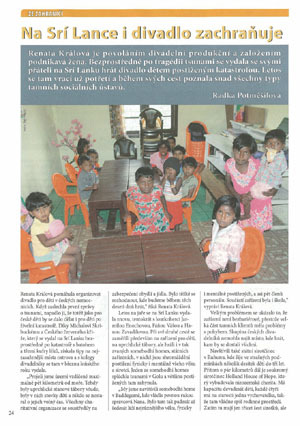 When the tsunami struck Sri Lanka in 2004, Czech actors decided that together with the organization Artists for Children, they will travels to camps, where the victims were temporarily accommodated. Many people were left without any accommodation for extensive periods of time and so the members of AFCH returned twice in 2006. In December they will be off to play in refugee camps of southern India, which still hold thousands of refugees from northern parts of Sri Lanka. Czech artists cooperate on this project with a Paris based humanitarian organization “Medicine sans frontiere” (Doctors without frontiers). A special experience for the actors was a meeting with refugee children, who are living alone in the Czech Republic. They played for the inhabitants of the facility Permon in Vestec near Příbram, which accommodates children of foreigners or in Modrá School in Prague’s Jižní Město District, where these children study. During the summer of last year, the artists ventured to places, where no theatre went before – to socially isolated locations, Roma ghettos, which arose over the past few years on the outskirts of some Czech towns. Local children do not have much initiative to spend their spare time doing interesting things. When the foundation „Člověk v tísni“ (People in need) started the campaign “LIQUIDATE! www.ceska-ghetta.cz”, the AFCH told itself that the theatre can also be used to combat intolerance. They’ve won over many terrain workers of the foundation for this activity. They are now conducting trips to visit the Roma people and their children for the second year in the row. In the port bay the members of the Czech expedition saw a coastline encircled in barbed wire and dotted with soldiers donning automatic rifles. Locals claim that this is where the humanitarian aid is being unloaded and then disappears without a trace… On the contrary, welfare agencies that have their own staff with local experience on the island, work without any problems. The end of their trip was complicated by an insect bite, which happened to producer Renata Králová. Even though the ensuing infection was treated by expats from the Liberec field hospital, upon arrival at the Prague Airport, she had to make use of a wheelchair. Even so, she is already planning an autumn return from her hospital bed. She intends to attend an exhibition of photographs taken on this trip by Petr Našic. “Currently, there are approximately 330 Roma ghettos in this country. We would gradually like to visit all of them,” Králová declared. She and her theatrical colleagues will visit Plzeň, Ústí nad Labem, Libčice nad Vltavou, Bílina, Chomutov, Litvínov or Liberec. Pic. : AUDIENCE. Roma children eagerly welcome the visit of theatre artists. Currently, there are approximately 330 Roma ghettos in the Czech Republic and the producers and the artists would gradually like to visit all of them. This year’s journey, which will last until the end of October, will take them to Plzeň, Kladno, Libčice nad Vltavou, Bílina, Chomutov, Litvínov and Liberec. Performances are conducted outside, amidst rummaged houses, sometimes on an improvised playground. Children come dressed in festive clothes, accompanied by their mothers. The artists consider the project in Roma community as a successful and enriching one.